Shakedown on VHS. 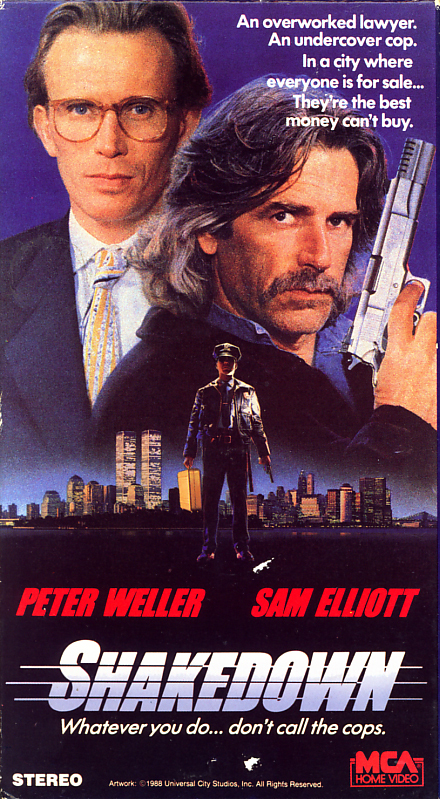 Starring Peter Weller, Sam Elliott, Patricia Charbonneau, Blanche Baker, Antonio Fargas. Directed by James Glickenhaus. 1988. An over-worked lawyer. An undercover cop. In a city where everyone is for sale… They’re the best that money can’t buy. Whatever you do… don’t call the cops. A burned-out legal aid attorney reluctantly teams up with a renegade police detective to find the truth behind the fatal shooting of an undercover cop by a notorious drug dealer. Targeted by a syndicate of corrupt cops and drug lords, the duo blast their way through the underbelly on New York in their unrelenting search for the shocking truth behind the crime. Filmed on the streets on Manhattan, Shakedown features some of the most incredible stunt work and chase sequences ever shot, including a death-defying fight scene atop Coney Island’s Cyclone roller coaster. It’s nonstop thrills from start to finish in one of the most entertaining high-speed cop films ever made.